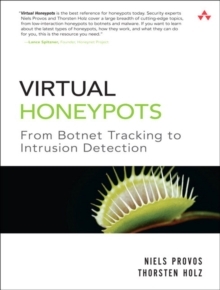 Praise for Virtual Honeypots "A power-packed resource of technical, insightful information that unveils the world of honeypots in front of the reader's eyes." -Lenny Zeltser, Information Security Practice Leader at Gemini Systems "This is one of the must-read security books of the year." -Cyrus Peikari, CEO, Airscanner Mobile Security, author, security warrior "This book clearly ranks as one of the most authoritative in the field of honeypots. It is comprehensive and well written. The authors provide us with an insider's look at virtual honeypots and even help us in setting up and understanding an otherwise very complex technology." -Stefan Kelm, Secorvo Security Consulting "Virtual Honeypots is the best reference for honeypots today. Security experts Niels Provos and Thorsten Holz cover a large breadth of cutting-edge topics, from low-interaction honeypots to botnets and malware. If you want to learn about the latest types of honeypots, how they work, and what they can do for you, this is the resource you need." -Lance Spitzner, Founder, Honeynet Project "Whether gathering intelligence for research and defense, quarantining malware outbreaks within the enterprise, or tending hacker ant farms at home for fun, you'll find many practical techniques in the black art of deception detailed in this book. Honeypot magic revealed!" -Doug Song, Chief Security Architect, Arbor Networks "Seeking the safest paths through the unknown sunny islands called honeypots? Trying to avoid greedy pirates catching treasures deeper and deeper beyond your ports? With this book, any reader will definitely get the right map to handle current cyber-threats. Designed by two famous white hats, Niels Provos and Thorsten Holz, it carefully teaches everything from the concepts to practical real-life examples with virtual honeypots. The main strength of this book relies in how it covers so many uses of honeypots: improving intrusion detection systems, slowing down and following incoming attackers, catching and analyzing 0-days or malwares or botnets, and so on. Sailing the high seas of our cyber-society or surfing the Net, from students to experts, it's a must-read for people really aware of computer security, who would like to fight against black-hats flags with advanced modern tools like honeypots." -Laurent Oudot, Computer Security Expert, CEA "Provos and Holz have written the book that the bad guys don't want you to read. This detailed and comprehensive look at honeypots provides step-by-step instructions on tripping up attackers and learning their tricks while lulling them into a false sense of security. Whether you are a practitioner, an educator, or a student, this book has a tremendous amount to offer. The underlying theory of honeypots is covered, but the majority of the text is a `how-to' guide on setting up honeypots, configuring them, and getting the most out of these traps, while keeping actual systems safe. Not since the invention of the firewall has a tool as useful as this provided security specialists with an edge in the never-ending arms race to secure computer systems. Virtual Honeypots is a must-read and belongs on the bookshelf of anyone who is serious about security." -Aviel D.
Rubin, Ph.D., Computer Science Professor and Technical Director of the Information Security Institute at Johns Hopkins University, and President and Founder, Independent Security Evaluators "An awesome coverage of modern honeypot technologies, both conceptual and practical." -Anton Chuvakin "Honeypots have grown from simple geek tools to key components in research and threat monitoring at major entreprises and security vendors. Thorsten and Niels comprehensive coverage of tools and techniques takes you behind the scene with real-world examples of deployment, data acquisition, and analysis." -Nicolas Fischbach, Senior Manager, Network Engineering Security, COLT Telecom, and Founder of Securite.Org Honeypots have demonstrated immense value in Internet security, but physical honeypot deployment can be prohibitively complex, time-consuming, and expensive. Now, there's a breakthrough solution. Virtual honeypots share many attributes of traditional honeypots, but you can run thousands of them on a single system-making them easier and cheaper to build, deploy, and maintain. In this hands-on, highly accessible book, two leading honeypot pioneers systematically introduce virtual honeypot technology. One step at a time, you'll learn exactly how to implement, configure, use, and maintain virtual honeypots in your own environment, even if you've never deployed a honeypot before. You'll learn through examples, including Honeyd, the acclaimed virtual honeypot created by coauthor Niels Provos. The authors also present multiple real-world applications for virtual honeypots, including network decoy, worm detection, spam prevention, and network simulation.